The team at Hohum lab has worked on designing and building a case with expansion board for the Axoloti Core, called the Axoctrl. The Axoctrl adds controls, ports and a display to the Axoloti Core, which should make prototyping and playing with the Axoloti Core a lot easier. And protect your board from dust and scratches! To make it easy to work with the Axoctrl, we've developed some patches and objects that provide some basic functionality for the Axoctrl. The main objects will make it easy to work with all inputs and outputs on the board, while also providing features such as patch switching, audio waveform on display and built-in LFO. In order for these patches to run, a fix to the objects/patch/outlet string.axo object is needed, otherwise you'll encounter a compilation error. See here for details on how to fix it (quite simple!). are the OLED objects from @SmashedTransistors or did you write something new? 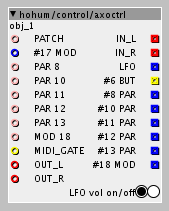 SmashedTransistors' objects seem to work perfectly on the axoctrl, FWIW. We used the existing OLED objects from @SmashedTransistors (which works awesome!). Would be cool to do some custom drawing stuff, but I don't see that happening anytime soon, alas. What I'm working on now, is to make it easy to give names to your parameters and show the values on screen when they update. Hope to have it ready (and released) by next weekend! Any plans to make them in dark colors? All black for example? Or just a back top instead of white? How is the object development going? Are they all fully functional by now? How is the parameter jitter? Are the pots stable and all, with no jitter? Any paging system so each knob can have multiple functions? Are the parameters endless encoders? I had more questions earlier but forget about them now. Maybe they'll come back soon. Anyone cares to upload some video to see it in action? I only found a 1 minute assembling video. ciao @hohum please give three for free for @SirSickSik @DrJustice @SmashedTransistors they know how to code ...and also load up your files up to hohum contrib gracie mille!!! and one for @me too ..
i bought one (white top, black case) as soon as they came out and overall i am very pleased with it. assembly is a little bit more fiddly than i had anticipated (getting the audio ports thru the wholes while fitting in the headers) but totally doable. some of the pots show a little jitter, which for my purposes isn´t a problem/easy to overcome. the buttons react well, the oled display really makes a difference, not so much for waveforms but for sample/patchnames. wish, it could display two or three lines of text from the factory objects. didn´t use the cv in/out yet. Hi Jaffa, thanks for your interest! To answer your first point, In the last 2 months we did lot of experimentation with designs and materials and we collected feedbacks from the first buyers in order to improve the actual design and make everyone happy with. In a couple of weeks (hopefully) we will go online with the new website where you’ll finally find more informations about the controller configuration and the building up, but also: new Axoctrl box styles, Axoctrl full DIY KIT, Axoctrl PCB and a couple of new products. I totally understand your scary, since my Keystep got completely yellow in less than a year, but that’s because a low quality paint. Anyway we have some new designs made out of Wood-filament and soft touch PETG with black top surface. You’ll surely fall in love with it. The development is going well and Berend (@hohum) will load soon new code on Github. You can download the Axoctrl testing patch from our website. All the parameters are variable resistors, there are no encoders. If you have any more questions we’re here! Hey Phil! we still have to send one to Johannes, he has the priority we've been quite busy in the last months but we're getting back in track! We will add a "contributor request" on the new website so developers can submit their interest and ask for a testing board. Thanks for the suggestion. Glad, for the sake of your future customers that you've reworked the design and materials. While functionally it was good, the quality of the 3D printed enclosure part of my axoctrl was laughably poor. Huge voids in the extrusion, messy thru holes (which required an hour of filing and trimming to make usable) and three strips of scotch tape on the top (with pots and plugs installed over it so it could not be cleanly removed) WTF?! I expected much better. Sorry I dont know too much about this stuff. Does that mean no jitter or low jitter? Yeah! I was really missing your disparaging and distrustful messages! When you are up enough to build an adult talk call me back! We've been super-available and respectful with every buyer, and with you too don't forget. We're doing our best. But still it's our "first time" doing this and we're learning too. how's it going @Hohum_Gian / @hohum ? where are you at with the code? anyway, great idea, and nice to see you pushing things forward. You sent us tons of bad emails complaining about delivery Nederland > Canada because it was late (during Xmas) and that you were expecting to be delivered in 3 days (We are not Amazon) but you didn't complain about the enclosure? You're doing it just now with this shitposting when you could have written us asking for replacement or return: so simple. Honestly I could ignore this thing now, not just because it's totally OT, but also because you are over time to play like this. Instead I decided to send you a replacement part because you also need a second chance to trust human beings. You will receive your part when is ready. Thanks for your order and to support our project! your package should arrive in 5 working days. Are you saying it's Karma that I received a junky enclosure because I contacted you regarding a what I thought was a lost shipment? 1) If you can't take some fair and honest criticism of your product without berating the critic, maybe you should try some other type of business. 2) Take a course in customer service. Apparently, the adage "the customer is always right" is concept foreign to you. 3) NEVER air your dirty laundry in public. It's a losing tactic no matter how tempting it is. Maybe implement a new rule that you don't ship something to a customer unless you would be proud to have it's picture displayed on the internet. Win/Win for you and your customers! Regarding a replacement part, don't worry about it. Sadly, the pictures speak for themselves. As far as i see, i prefer my cardboard enclosures. Hope to see photographs of higher quality stuff from other users. @SmashedTransistors I know they are working with some new materials.